Size: 584 sq.ft. - 3296 sq.ft. Eagle's Nest compromises of N number of options from apartments to duplex living spaces. It is very unique residential plan by Naiknavare Developers in Talegaon. It is a RERA registered project P52100002518 with clearance from MoEF designed over the 64 acres of area with wide lush open spaces. With this development Naiknavare Builders is trying to offer an exclusive featured community. Eagles Nest is an environment friendly project and an impressive gateway to one of the azure residential community. It has very picturesque site with many internal roads. 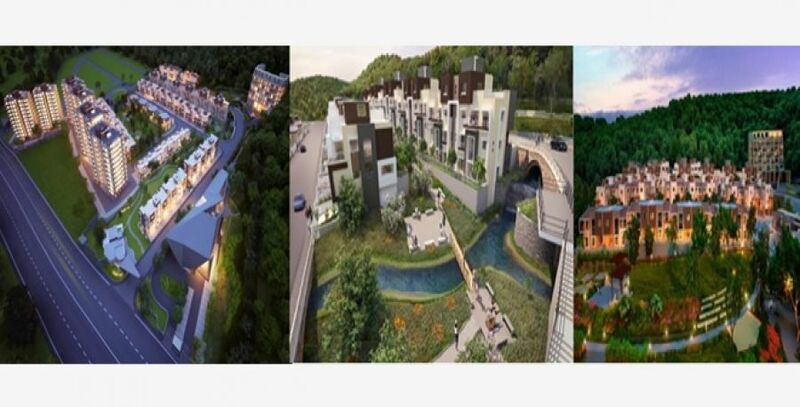 This project is developed above sea level at 1900 feet to present you unobstructed views of hilltops with fully grown forests, Waterfalls, hills and several dreamy and relaxing options. This monumental residential landmark is ready for possession where the pricing of the homes ranges from 25 lacs onwards. Naiknavare Eagles Nest is well connected to Pune and Mumbai cities. Residents are at short distance from Lonavala hill station featuring big pillars, intricate relief sculptures in the Karla Caves and Bhaja Caves are carved out of the rock. Eagle's Nest is in proximity to the reserved green zone and forest area of Sahyadri. Apart from common amenities it also serves many social amenities like schools, shopping centres, reputed hospitals, restaurants etc. Eagles Nest Taleagon is just perfect location that an occupant look for. The crowning jewel of this project is the seasons resorts and clubs within it. The neighbouring projects in Talegaon Wadgaon are VTP Urban Life, La Montana, Neelaya, Mantra City 360, Rio Vista, Xrbia Riverfront etc. Naiknavare Eagles Nest development is near NH 04 in Vadgaon Maval Taluka, Talegaon Dabhade, Pune, Maharashtra - 412106. Naiknavare Developers are Pune based housing development company are into the real estate business since last 27 years. The chairman of the company is D.P Naiknavare and the directors are - Mr. Hemant Naiknavare, Mr. Ranjit Naiknavare and Mrs. Gauri Naiknavare. Naiknavare Developers has a great team of professionals with the staff strength of 200+ is known for its Excellency in architectural. Creating residential projects, schools, hotels and commercial spaces is Naiknavare Developers vision with uphold quality. Each spaces enables you to concentrate on building a business, career, connecting with friends etc. Naiknavare are the most appreciated developers for providing product and services that are recognized for integrity between Customer and the developers. Naiknavare Developers projects are located in Navi Mumbai, Pune and Kolhapur cities. Drivers Dormitory, Security Cabin and Intercom Facility, Ample Parking Facility for Residents & Visitors, Vehicle-Free, Eco-Friendly Street-Light & Common Area Light-Fittings, Building-Surrounds in Eco-Friendly Paving Blocks, Generator Back-Up For Common Lights, Lifts, Pumps, Community Centre, Multipurpose Court, Kids Play Area, Party Lawn & Amphitheatre, Multipurpose Club House, Designer Landscaped Gardens, Jogging or Walking Track, Pavilions, Play Area, Swimming Pool, Indoor & Outdoor Game Facility, Dedicated Senior Citizen Area, Gazebo, Flowerbeds, Water Body, Children's Play-Area With Play Equipment & Multipurpose Court, Internet/ Dish TV /Intercom Facility for All Units, Elevators, Pavements, Driveways, Underground Water Tank Water-Supply, Sewage Treatment Plant With Tertiary Treatment, Water Conservation By Recycling For Flushing & Gardening, Rainwater Harvesting With Re-Charge Pits, a Large Covered Sit-Out with Party Lawns and Organic Waste Convertor For Garbage Disposal. Schools - SmileKidz Pre School, New English School, High Vision English Medium School, Heritage School by Pearson, Shinde Hill Paragliding Nirvana, BK Birla Centre For Education, EuroKids Talegaon, Kendriya Vidyalaya, Kidzee Dehuroad, Akshara International School, Podar Jumbo Kids, Smart Kids play School. Hospitals - Heart Hospital, Sonai Physiotherapy Center, Kurkute Hospital, Matoshri Hospital, Pioneer Hospital, Dr. Bansal Hospital, Madhavbaug Clinic, Madhavbaug Clinic - Chinchwad,Dhanwantari Hospital, Kartik Hospital. Restaurants - Dosti Dhaba, Hotel Darshan Dhaba, Food Court. Bank/ATM(s) - Vijaya Bank, Bank of Maharashtra, ICICI Bank, HDFC Bank. Multiplexes - Shri Shivaji Talkies. 584 sq.ft. - 3296 sq.ft. 382 sq.ft. - 515 sq.ft.